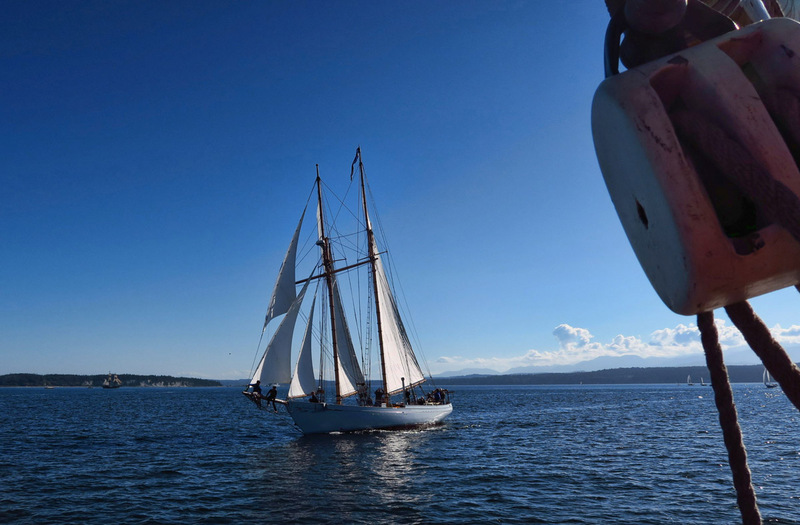 In doing some research prior to the festival start, I somehow landed on the website for the Sound Experience, an environmental education and sail training program on Puget Sound aboard the historic schooner, the Adventuress. 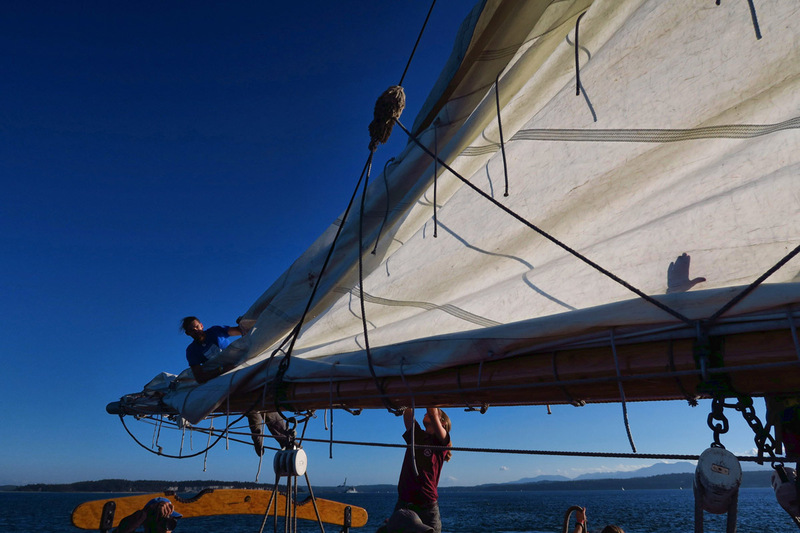 Sound Experience is a non-profit whose mission is “to educate, inspire, and empower an inclusive community to make a difference for the future of our marine environment.” The Adventuress was offering a three hour passenger sail during the Sail By, and it was listed as one of the best vantage points for viewing this end of festival celebration. And so I splurged. 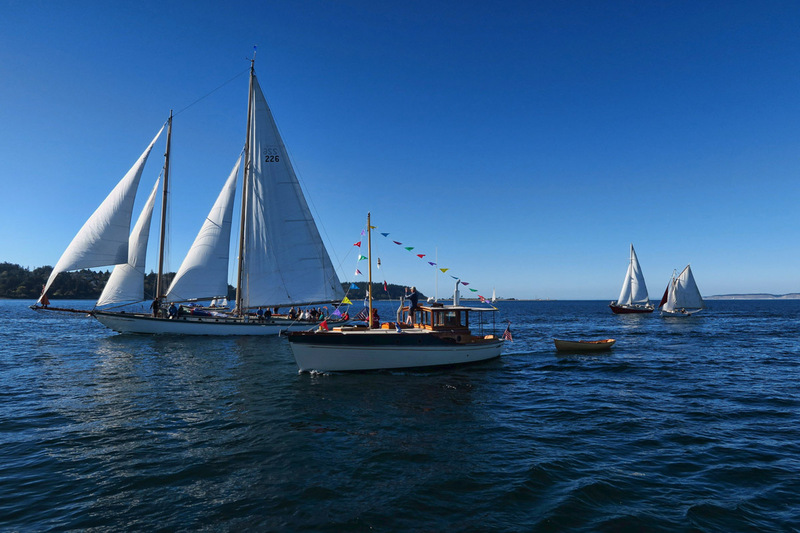 I have booked a ticket for a three hour sailing cruise during the Sail-By on the Adventuress. 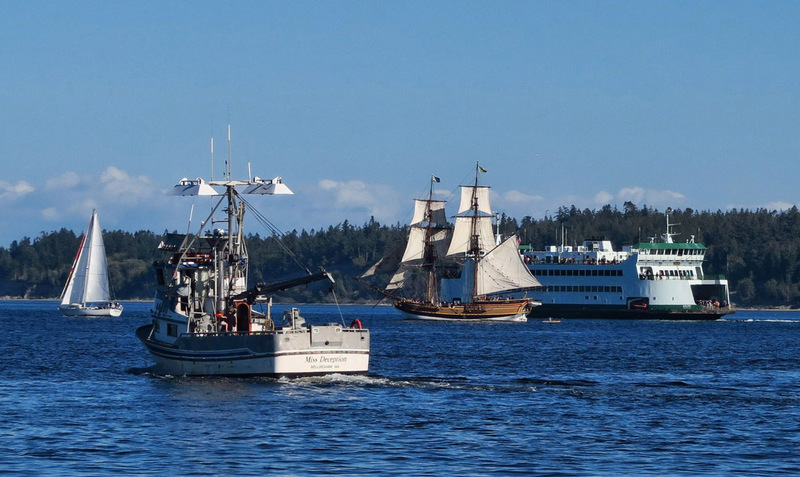 Vessels of all shapes and sizes enter Port Townsend Bay for the Sail-By. I am pleasantly surprised to learn the Captain of the Adventuress is female. In fact, there are as many young women on the ship, some paid, some volunteer, as there are men. Captain Rachel gives us a safety briefing. 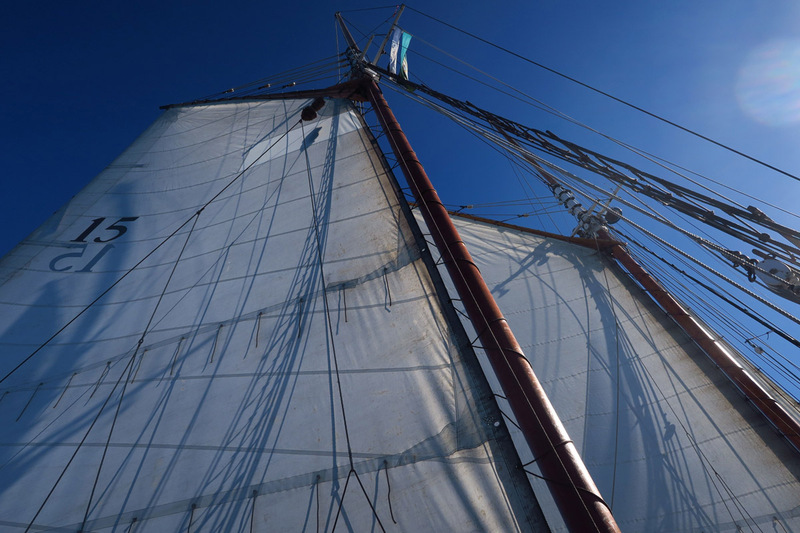 Adventuress is identified by Sail Nbr 15. Once on board, we get a bit of history and sailing lore mixed in with a safety briefing in our muster station. 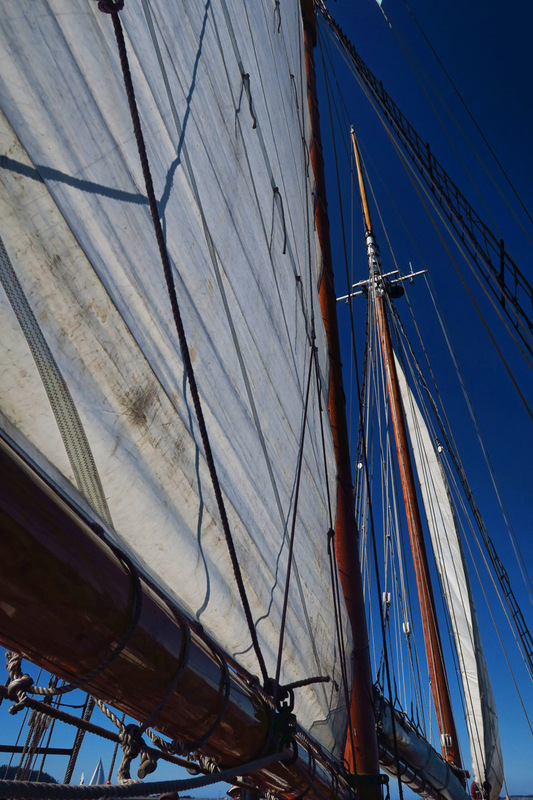 We learn the 133’ Adventuress, a gaft-rigged schooner, was built in 1913. 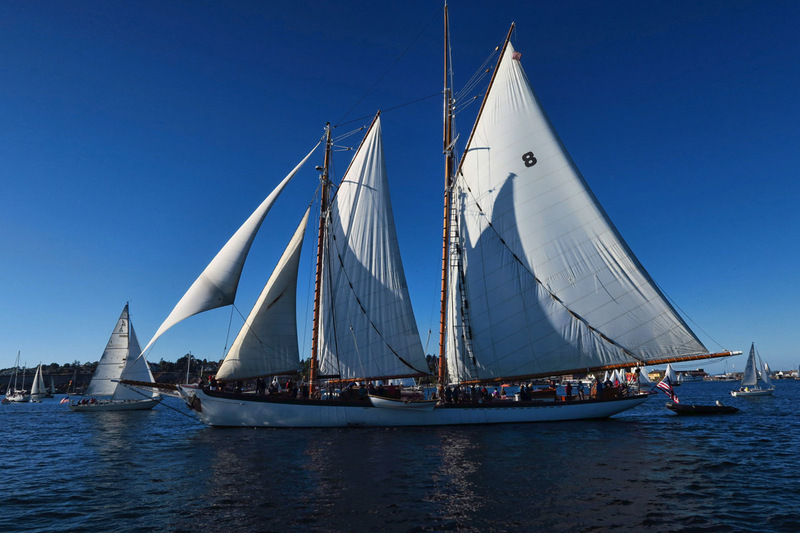 With a rich history which includes whale hunting in Alaska to guarding San Francisco Bay in WWII, she was added to the National Historic Register in 1989. 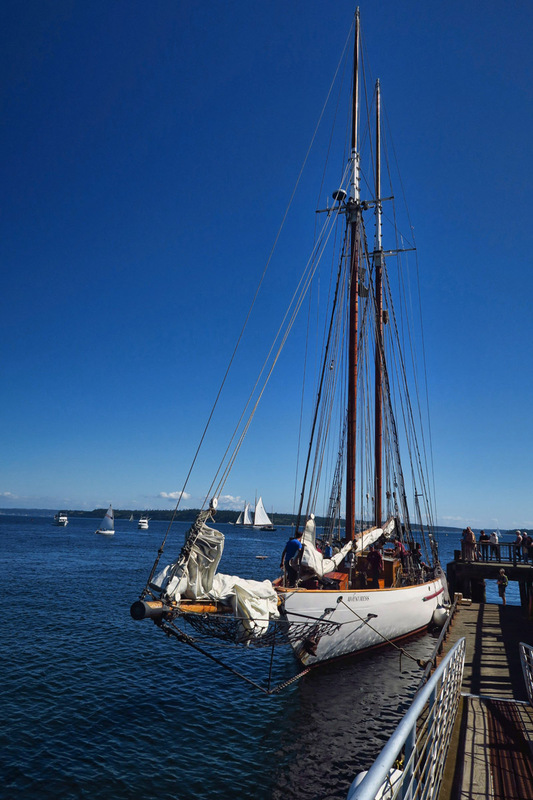 It’s a quintessential sailing day in Port Townsend with blue skies and steady breeze. 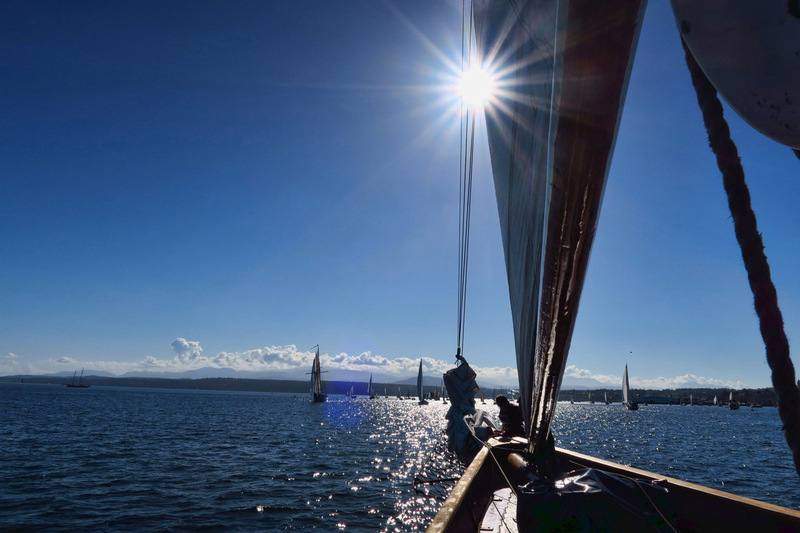 Cool, with that nip of fall in the air that I just adore about September sailing. 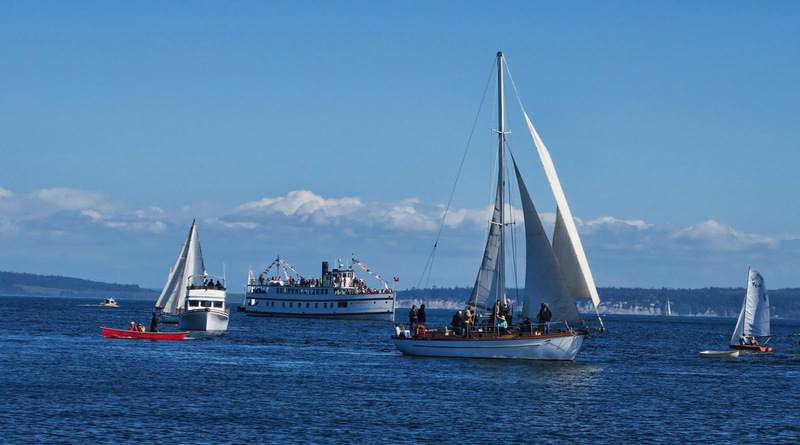 There aren’t as many aboard the ship as I had feared, making it easy to find a spot on the rail to view the gorgeous boats sailing by. Many are locals who know each other, so it’s fun to hear them shouting back greetings between boats. This boat appears to have some tribal reference, but not sure what. Lifeboat doubles as fender storage. 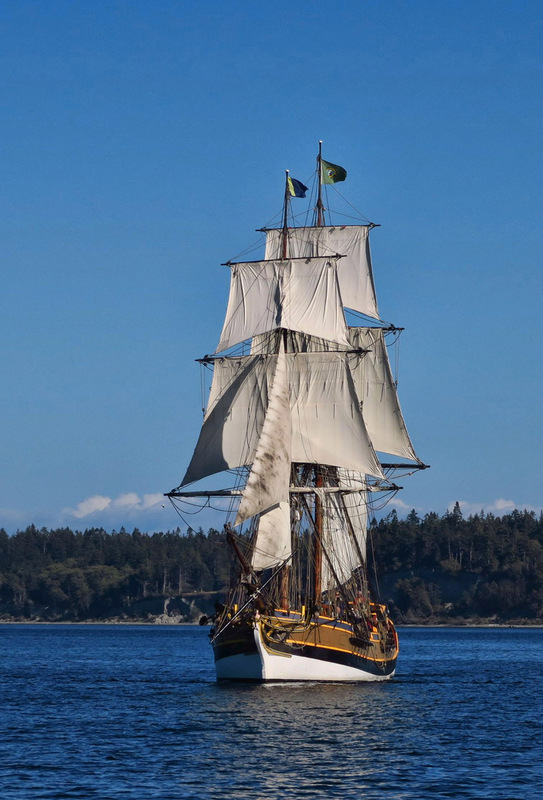 The Lady Washington, replica of an 18th century, 90 ton Brig. 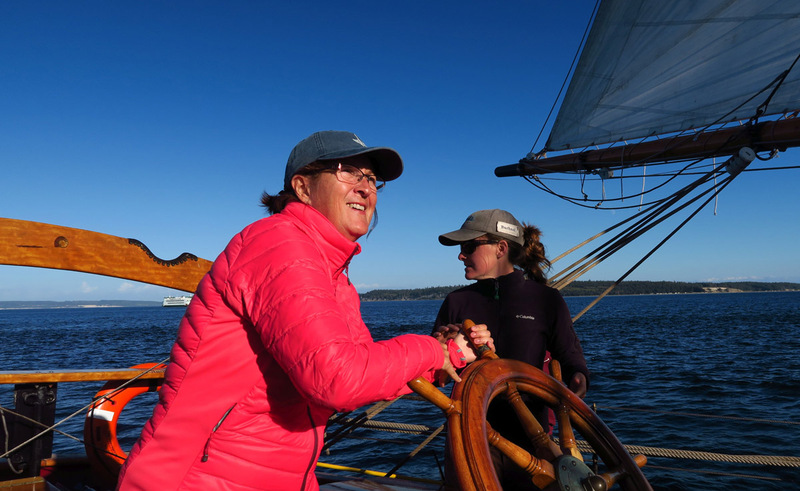 Captain Rachel navigates us through the heavy traffic as boats of all sizes and shapes fill the small bay area along the waterfront of historic Port Townsend. 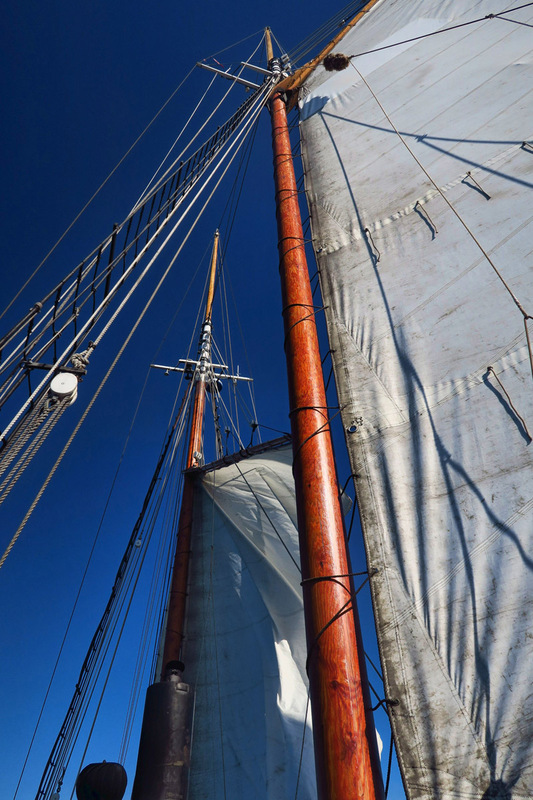 Everything from tall ships to stand up paddle boards. 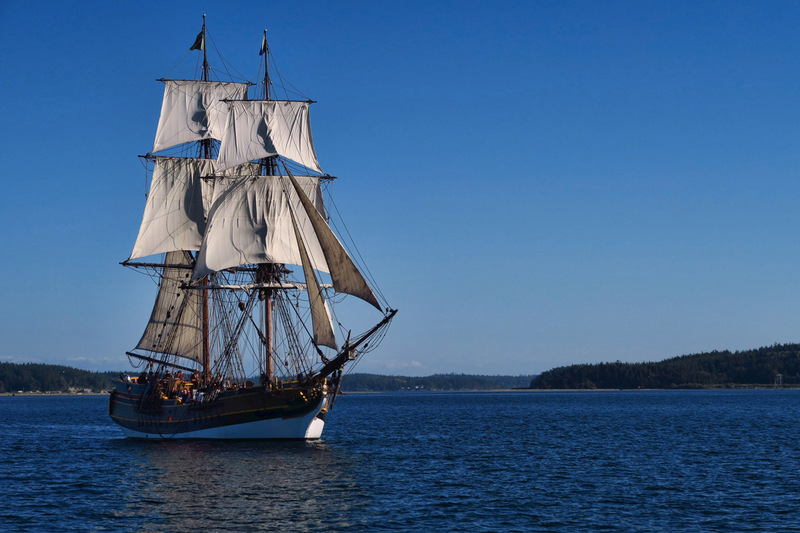 Lady Washington has starred in many films, including role of HMS Interceptor in Pirates of the Caribbean. She has a foreboding profile on the water. Even a few fishing boats get in on the festivities. As the sun drops lower in the sky, the crowds on the water begin to wane. 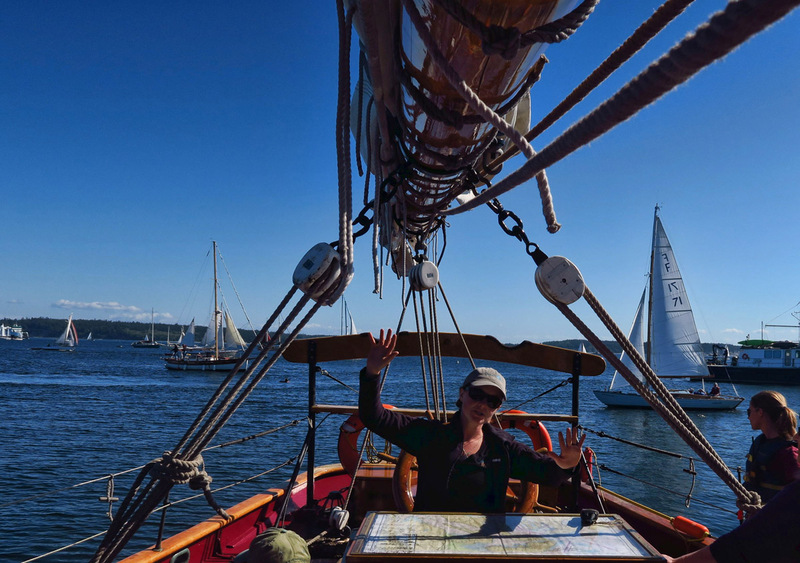 Now with less traffic to navigate on the bay, Captain Rachel asks, “Anyone want to take the helm?” I can’t imagine a more thrilling ending to such a fun-filled weekend! 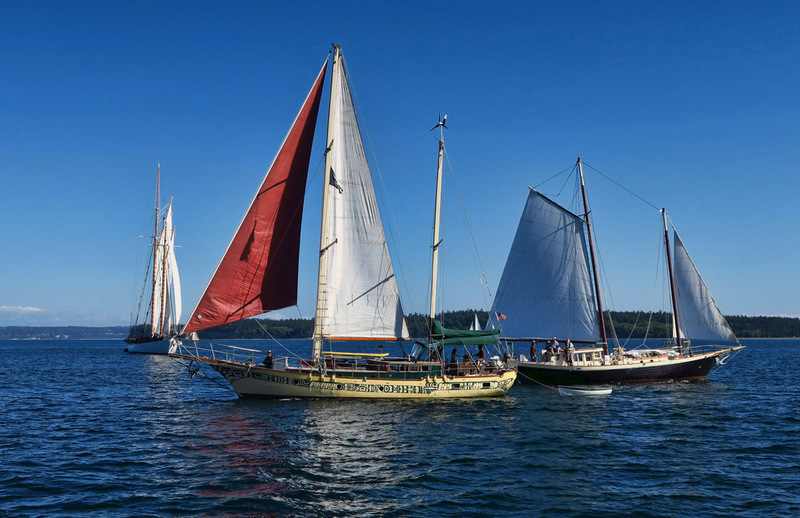 This entry was posted in Washington and tagged Adventuress, Port Townsend Wooden Boat Festival, Sound Experience by Suzanne. Bookmark the permalink. Wow, what a festival wrap up! You’re livin’ your dream! …now and then a giggling trail of mermaids appeared in our wake. We fed them oatmeal. So glad you didn’t book the S. S. Minnow for your three hour tour!!! 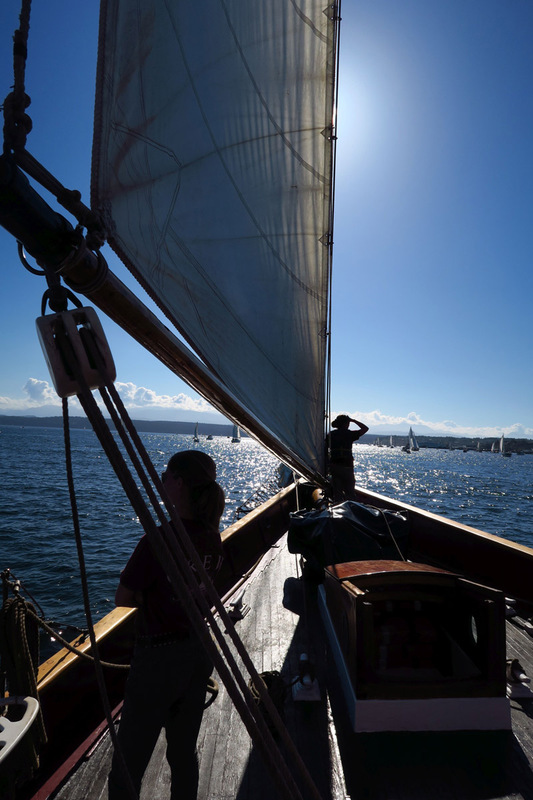 What a great way to end the wooden boat festival. 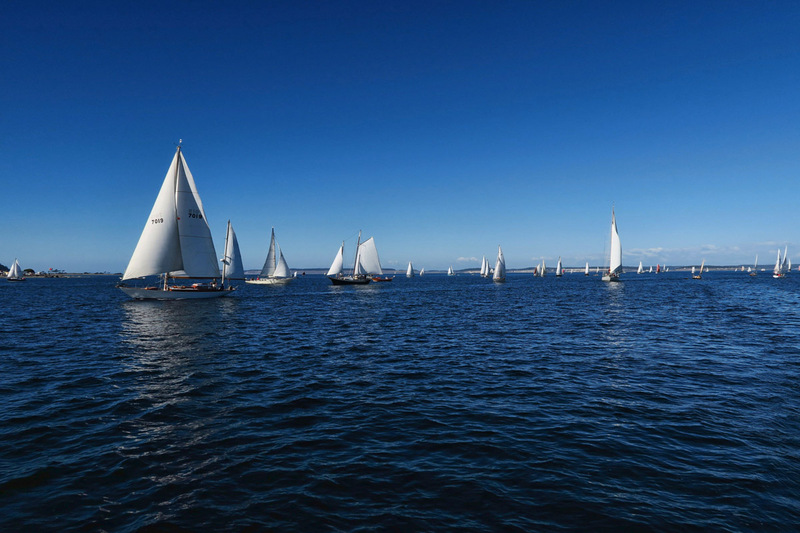 The weather looks just about perfect for sailing and wish I could have heard you salty gals singing the sea shanty. What a fantastic “splurge”. For sure!! 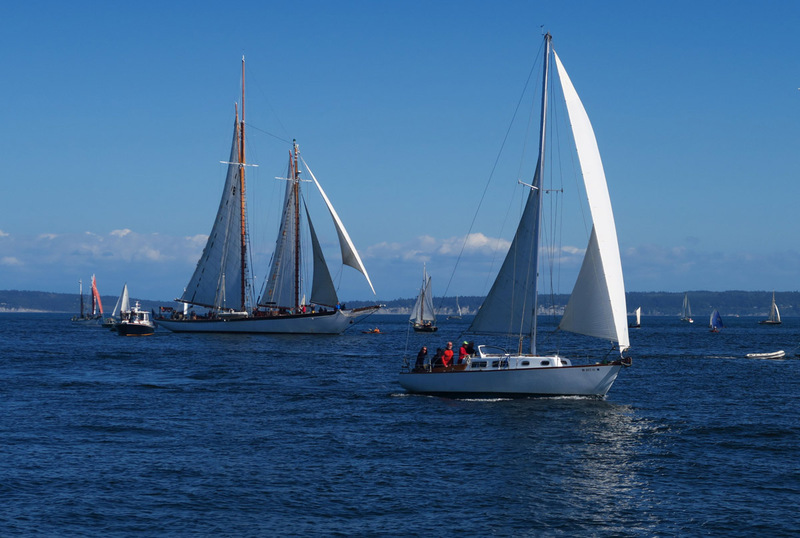 I love sail boats almost as much as lighthouses. 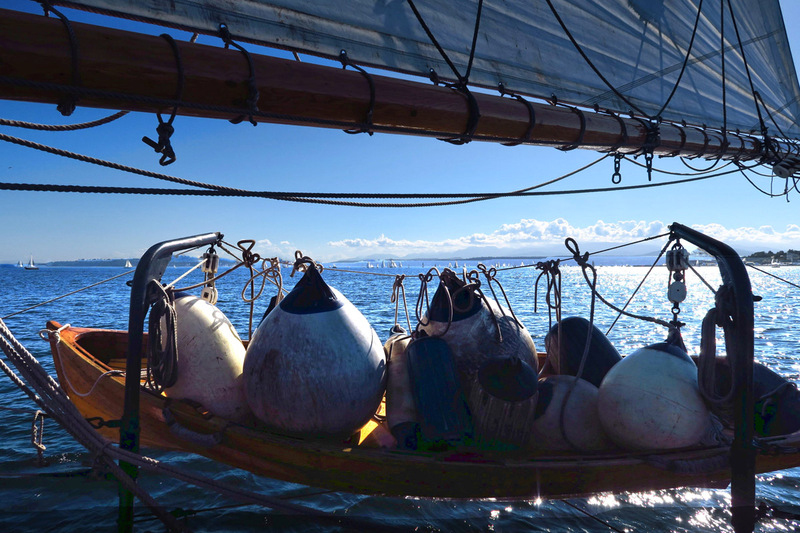 I’ve always had a sail on a tall ship on my bucket list. Yes, it still sits there. I can’t even imagine what thrill it was to take the helm. Color me a brilliant shade of green. Loved reading this and the pictures are outstanding. Carry on! Your last picture says it all! Another adventure to add to your life story! Wow. Just wow. I can smell the air, feel the wind, and am grinning from ear to ear. So glad you splurged and shared your adventure with us! You look like a natural behind that wheel! These past few months have been quite hectic in our lives with parental health care, but all is well now and I am finally catching up on my blog reading. You have had quite the wonder-filled time in Washington. Fun to see that your brother joined you in Oregon. We missed out on the crab on our last visit to Winchester bay but enjoyed grilled oysters instead! 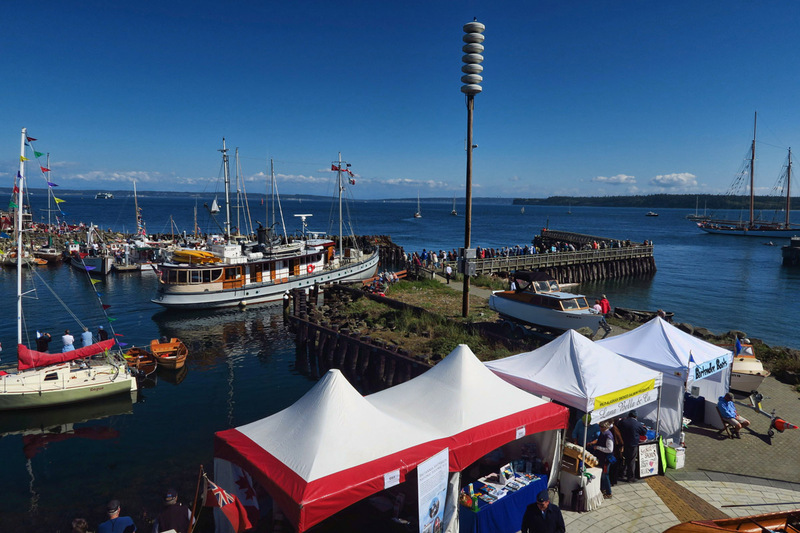 I absolutely admire the way you immersed yourself in the wooden boat festival experience. Will you be heading to Utah again this fall? We are thinking of going that way either before or after Thanksgiving. I’ll be reading some of your previous posts about that area later today. What a thrill this must have been for you Suzanne!